Significance: One of the famous temples in Tamilnadu steeped in tradition and history and also known for its musical pillars and other brilliant sculptural splendours. This temple houses a shrine to Shiva and Parvati dating back in time covering a 14 acre area. Shiva is said to have been worshipped by Agastya in a bamboo grove and by Rama after having killed Mareecha some nine miles away at Manoor. There is also a shrine to Vishnu near the sanctum, signifying the belief that Nellai Govindan (Vishnu) visited Tirunelveli to officiate the divine marriage of Shiva and Kantimathi. There are several other legends associated with this temple. Near Tirunelveli, are the nine Vaishnavite temples dedicated to Vishnu (the Alwar Nava Tiruppatis), the Krishnapuram Venkatachalapati temple with its brilliant sculptural work, Tiruchendur with its grand and imposing temple dedicated to Subramanya, and Kutralam a popular tourist resort with its charming waterfalls and abundand natural beauty. The region between Tirunelveli and Kutralam abounds in natural splendour. Mention must be made of Tenkasi, Papanasam and Ambasamudram. Further, Kanyakumari the Southernmost tip of India is only a couple of hours away from Tirunelveli. Antiquity: The temple dates back to 700 AD and has been sung by the Saivite saint Tirugnana sambandar. Supposedly there were two distinct temples for Shiva and his consort both built by the Pandyan kings and the Sangili Mandapam linking these two were built in the 17th centuries. The towers also date back to early 17th century. There are inscriptions dating all the way back to 950 AD in the temple. Architecture: Vast in area, this temple never ceases to surprise visitors for the wealth of detail it has to offer. 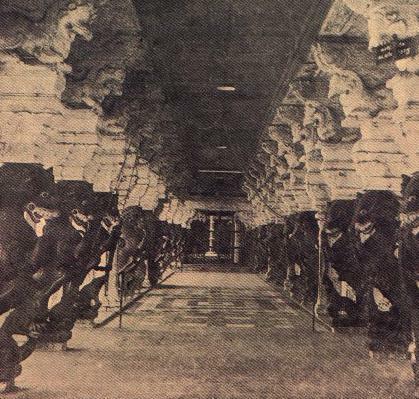 The musical pillars in the Mani Mandapam which produce sound in various pitches when struck (7th century AD by Nindrasir Nedumaran or Koon Pandyan), the Somavara Mandapam, the 1000 pillared hall, and the Tamra sabha with intricate wood work, and the Vasantha Mandapam are some of the noteworthy points in this temple. Lifelike sculptures adorn several of the mandapams in the temple, noteworthy ones being in the Sangili Mandapam which links the temples of Nellaiappar and Kantimathi in this vast temple complex. Tamra Sabhai: The Copper Hall of Dance is a brilliant work of art, and is housed within the inner precincts of the temple. On the occasion of Arudra Darisanam (occuring in the Tamil month of Margazhi - Dec 15 - Jan 15), the images of Nataraja and Sivakami are housed here, and elaborate worship protocols are observed during the enactment of the Cosmic Dance of Shiva. A shrine to Sandana Sabhapati (adorned with sandal paste) is located right behind the Tamra Sabha and to a visitor walking towards the Tamra Sabha, the combination of these, i.e. the vision of Sandana Sabhapati seen through the Tamra Sabha presents a brilliant spectacle. There is yet another shrine to Nataraja here, the Periya Sabhapati shrine. Religious services are carried out here on special occasions, and this festival idol is never moved from this shrine. Other: Navaratri, Tirukkalyanam in Aippasi, (Oct 15 - Nov 15) and Arudra Darisanam are some of the important festivals here. Arudra Darisanam attracts huge crowds here.The temple charriot is a massive one, second supposedly only to Tiruvarur. The Bhrammotsavam here lasts for an extended period of time during the Tamil month of Aani (June 15 - July 15).